The wife of a Coral Springs medical supply company executive who is being held at his Beijing factory amid allegations of unpaid wages said he is frustrated and exhausted. Chip Starnes, 42, of Specialty Medical Supplies, peered out from behind the bars of his office window Tuesday as he sat in captivity at the plant in the capital's northeastern suburbs. The workers claim they had not been paid in two months, though Starnes denied the allegations. A medical supply company executive from Coral Springs endured a fifth day of captivity by Chinese workers at his Beijing factory amid allegations of unpaid wages. Chip Starnes, of Specialty Medical Supplies, peered out from behind the bars of his office window Tuesday as he sat in captivity at the plant in the capital's northeastern suburbs. "He is just very frustrated. He wants out. He's exhausted. He's worried about his managers. They're being held as well," said Starnes wife Cecily. About 100 workers are demanding back pay and severance packages identical to those offered 30 workers being laid off from the company's plastics division. The demands followed rumors that the entire plant was being closed, despite Starnes' assertion that the company doesn't plan to fire the others. "Very worried, just want him home. His kids want him home. Everyday we do get to talk to him. So, that's good. We get to see him on TV and talk to him, so we know that he's safe," Cecily Starnes said. "The emotions are real. They are raw," said his brother John Starnes. "We are nervous for him being over there. You know, on the other side of the world, and there's really not anything in essence that we can do." Business partner Les Capella told NBC 6 South Florida Tuesday that he's hopeful the two sides will reach an agreement. "They're coming around a little bit, and through some of our negotiations and dialogue. So we just have to keep doing it that way, it's a different culture," Capella said. The dispute highlights general tensions in China's labor market as bosses worry about rising wages and workers are on edge about the impact of slowing growth on the future of their jobs. Inside one of the plant's buildings, about 30 mostly women hung around, their arms crossed. One worker, Gao Ping, told reporters inside an administrative office in the plant that she wanted to quit because she hadn't been paid for two months. Dressed in blue overalls and sitting down at a desk, Gao said her division - which makes alcohol prep pads, used for cleaning skin before injections - had not been doing well and that she wanted her salary and compensation. Workers in other divisions saw how badly her division was doing, thought the whole company was faring poorly and also wanted to quit and get compensation, said Gao, who had been working for the company for six years. Starnes denied that they were owed unpaid salary. "They are demanding full severance pay, but they still have a job. That's the problem," he said, still in the clothes he wore when he went to work Friday morning. Chu Lixiang, a local union official representing the workers in talks with Starnes, said the workers were demanding the portion of their salaries yet to be paid and a "reasonable" level of compensation before leaving their jobs. Neither gave details on the amounts demanded. Chu said workers believed the plant was closing and that Starnes would run away without paying severance. 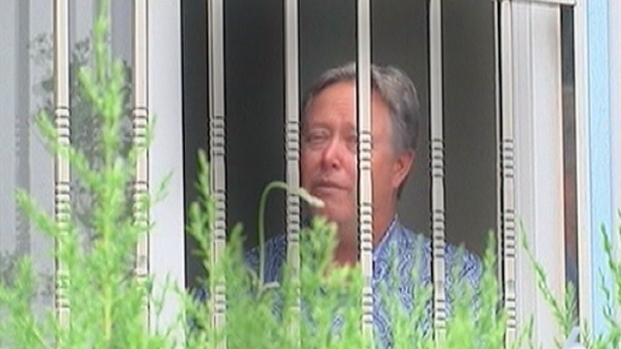 Starnes' attorney arrived Tuesday afternoon. Chu later told reporters that there would be no negotiations for the rest of the day. Starnes said that since Saturday morning, about 80 workers had been blocking every exit around the clock and depriving him of sleep by shining bright lights and banging on windows of his office. Capella called it a "miscommunication." "There was a miscommunication that we were moving everything so that's what the couple renegade employees were spreading around," he said. Capella denied rumors that the factory is shutting down and said all employees have been paid. He said he's been in constant communication with Starnes, who he considers his best friend. He said Starnes is making the best of a tough situation but his family, including his wife and children, are deeply concerned. "He's in an office where there's a cot, as of recently, and there's a small refrigerator," he said. The standoff points to long-ingrained habits among Chinese workers who are sometimes left unprotected when factories close without severance or wages owed. Such incidents have been rarer as labor protections improve, although disputes still occur and local governments have at times barred foreign executives from leaving until they are resolved. Starnes said the company had gradually been winding down its plastics division, planning to move it to Mumbai, India. He arrived in Beijing a week ago to lay off the last 30 people. Some had been working there for up to nine years, so their compensation packages were "pretty nice,'' he said. Then workers in other divisions started demanding similar severance packages on Friday, he said. Kevin Jones, who advises U.S. companies on Chinese labor and employment law, said it is better if American executives stay at home and let their local managers lay off workers. In a case last week, Jones said the chief financial officer of a U.S. telecommunications equipment maker wanted to come to Beijing to explain the situation and give 41 white-collar workers their termination notices. "We told him to stay in America," said Jones, who chairs the Shanghai-based Faegre Baker Daniels labor and employment practice. The company's lawyers met with six employee representatives in a hotel. "We had two bodyguards but that was just in case things got out of control," Jones said. Christian Murck, president of the American Chamber of Commerce in China, said Chinese labor law specified a minimum severance pay in the event of a layoff due to economic necessity or if someone is dismissed due to cause, but not a maximum one. "There is a kind of structural weakness in the way the labor law is set up that leads to negotiations and disputes when departures occur,'' Murck said.